What is Unique about European Civilization? With a simplification approved by most everybody, it is said that European civilization has its historical roots in ideas from Athens about reason, in ideas from Rome about the rule of law, and in ideas from Jerusalem about charity. Some thinkers in ancient Greece were among the first to realize that reasoning can open a new universe to men, which is more perfect and much simpler than the one we spontaneously can experience. The thing that we can see and touch change incessantly, appear and disappear, turn from one to another. Colors fade, water evaporates, seasons change, men die. The same holds for our inner world. Wants and desires shift and contradict one another; we want sometimes this and sometimes that. There is and endless number of things to keep track of and to respond to. The concepts, however, form a world of unchanging and exact entities. The virtuous man has also his weaknesses or vices, but the idea of virtue is void of vice. The idea of white contains nothing but whiteness, the idea of movement never changes for rest. These ideas enter into relations with each other without losing their identity or making each other turbid. Their relations are determined not by chance, circumstance or fluctuations in a market place, but by an unambiguous, small number of rules of logic, foremost of which is syllogism. Thus, ordinary discourses of men can be fitted into a more perfect abstract discourse. It is easy to understand the excitement experienced by Socrates and his followers in Athens, particularly Plato, in seeing the clean, cool, lucid outlines of ideas arise in their midst. They felt they had discovered a new reality which by comparison made the everyday world look drab and even unimportant. It gave them a new mission: to add the reasoned to the spontaneous. This theme of rationality has emerged several times in history and has been analyzed by Max Weber as an "iron cage" in the European enchanted garden. An exercise. Find entries on Max Weber on the WEB and search for discussions of the concept of "rationality" and the metaphor "iron cage". Do this type of excursion whenever you find an interesting idea, event, place, or person in the lecture. In ancient Rome statecraft became a supreme art, more important than religion, philosophy, the fine arts, or commerce. In the Roman Republic we find administration, police procedures, court rulings carried out with such care. The idea that the republic should be ruled by laws, not by the whims of rulers, gained expression. When the republic succumbed to the rule by emperors this became a less consistent practice. During the Roman emperors, however, the state took much responsibility for the citizens, for their daily bread and their entertainment. Well-organized armies guaranteed the Pax Romana. In ancient Palestine people made religion pivotal in society. The same has occurred in many other places. But the ethical discourse was in a class by itself: from Moses and the Ten Commandments to Jesus and the Sermon on The Mount. Among God's chosen people prophets could inspire and criticize both the high and the low using excellent moral arguments. All known civilizations, however, have their manifestations of faith in reason, of justice, and of love for one's fellow humans. To assert the uniqueness of the European civilization, one must find something distinctive in its view of reason, justice, and human dignity, or something distinctive in the way these have become embodied in the social order. How does European civilization differ from others? When this question is posed in the Third World, the answer is straightforward and hardly flattering: colonialism, racism, and communism. The European continent, with its cultural leaders Spain, England and France in the forefront, was responsible for imperial occupation, slavery and exploitation. Colonialism was one of Europe's major projects. The outcome of European wars determined the borders on other continents. In the colonial period, Europe also believed that the white person was superior to all other races and entitled to rule over them. Racism and ethnic cleansing has been practiced within Europe as well, most systematically by Nazi Germany. Nazism, a form of racist barbarism organized in thought and action, is a European experience; and the Nazi extermination camps were a European project. The European continent also sponsored communism, including its abhorrent Stalinist versions. The European Enlightenment of the 18th century had an offshoot in Marxism, which sought to be the applied science of society. Russia, and also many developing countries after their liberation from colonialism, had to suffer Marxism's economic planning, elite rule, centralism, and lack of freedom. Stalin's Soviet Union is, assuredly, another child of Europe, and the Gulag is as much a European project as Buchenwald. The mad streak in European history is aptly illustrated by Picassos painting Guernica. The European versions of oppression and cruelty we call colonialism, Nazism and Stalinism are, however, not so unique as to define the scope and spirit of European culture. In some way, human beings appear to be of faulty design: large-scale and systematic atrocities and tyranny have occurred in every epoch and all civilizations. It is not certain that Europe was worst, or that Europe's versions are different in kind. Anyhow, Europe's uniqueness should be sought not only in exceptional oppression and cruelty, but also in innovations of worthy social orders. Let us, therefore, search the silver lining in the European cloud. It gives one pause for thought and hope that the North American scions of European civilization - The United States and Canada, both former colonies - have, as a matter of policy, largely refrained from colonialism and have played a crucial role in combating fascism and communism. How does European civilization differ from others? When asked this question, an ordinary European today normally answers: "welfare," "technology," and "democracy." 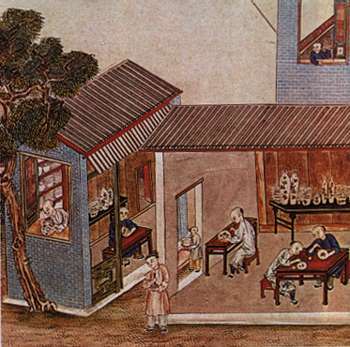 The emperors reestablished the examination system and created a new, complex bureaucracy. Its characteristic and purpose were that all true decision-making was reserved for the emperor himself and his closest adviser. The state also assumed welfare functions . . . : the old people's homes, the clinics, the children's homes, the cemeteries. The policy adopted was a kind of secularization. . . . The new bureaucratic and mercantile upper class embraced rationalist ethics. . . . The process of intellectual rationalization reflects the whole development of society. . . . Agricultural rationalization proceeded apace, with increasingly intensive rice-growing and the use of varieties that yielded two or three harvests a year. On this basis /the/ population now, for the first time, topped 100 million. The commercialization of the economy also continued: road and river transport systems were extended and large, multi-decker vessels propelled by blade wheels plied the waterways. Ocean-going ships now used the magnetic compass. . . . Both trade and the taxation system were based more and more on monetary thrift, and when metals no longer sufficed, or became cumbersome as means of exchange, there was a switch to the printing of bank-notes. Not only farming and commerce were modernized. It has been calculated that the use of iron and coal grew faster . . . than during the first two centuries of the English Industrial Revolution. Coal increasingly replaced charcoal. Iron was more and more often used for agricultural implements and weapons, in shipbuilding and bridge-building, in pagoda designs and even in images of deities. . . . The old towns, walled and divided into various specialized districts, were demolished. Open, functionally mixed towns took their place, some getting populations of a million or more. This description of a land with technology and welfare and other aspects of modernity is not taken from England in the late 18th century or from France or Germany in the 19th century. As you have guessed, the description is of China, specifically, during the Sung Dynasty of 960-1200. 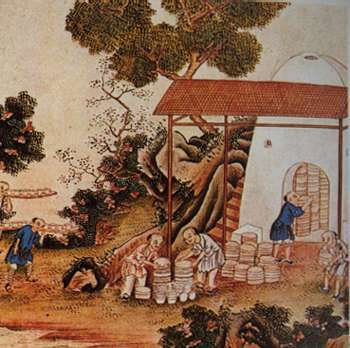 Technology and welfare are not unique to Europe; this was more than obvious to Marco Polo, whose visit to China came shortly after the period described. Professor Åke Holmberg whose description of Sung China we cited (omitting any reference to the time and place) has also selected these two illustrations of china manufacturing to add to our image of Sung achievements. Click them to see them enlarged. Pictures from Åke Holmberg Vår världs historia ("Our Worlds History") volume 1, edition 1982, page 170 (Mondadori archives. The similarity between China during the Sung period and present-day Europe should not be exaggerated. In China, the emperor was not only the political ruler and military commander; he was also the chief engineer and the supreme scientific authority, the sovereign of trade and industry, and the arbiter of artistic beauty and civic virtue. He was also a god. This integration of all worldly, economic, scientific, artistic, moral and religious power and status in a single person is a clear antithesis to what became uniquely European. How, then, does European civilization differ from others? Does the difference, in fact, lie in its rejection of the idea of an emperor with the right to adjudicate over every sector of society? A frequent man-on-the-street answer to our question is "Democracy". Governance of the people based on free formation of opinions and majority rule are claimed as a European social innovation. This reply perhaps demonstrates, above all, a belief in the dominant, shared ideology of the 20th century. Constitutional democracy dates back - for most European states - only decades, not centuries, and democratic constitutions have never been a sustained feature of the history of the European continent. Nevertheless, some indication of European uniqueness is to be found in the story of the genesis of democracy - a highly instructive myth. The story is a Greek one, recounted by Protagoras in a dialogue with Socrates. We may summarize Plato's report of this part of the conversation, rather than quoting it in full. When people moved into towns, Zeus discovered that they were unable to stay on good terms. They were in mortal peril in their struggle against nature and destruction of one another and one another's resources. The reason for their conflicts and insecurity was that they lacked the art of politics. Zeus then sent his messenger, Hermes, with two gifts to humankind. One, aidos, was the ability to react to public opinion. The other, dike, was the ability to respect human rights. These two gifts were to be the foundation of political skill and to enable townspeople to live in civic harmony, settling their destiny and disputes by peaceful means. What Hermes wanted to know was whether the skills of politics should be granted to one and all, or only to a few, that is to say, to the whole people, or to a ruling elite. 'To one and all', was Zeus' reply. The distinctive position of government as the only democratic institution in society was emphasized by Protagoras when he used this myth to explain to Socrates (who, as portrayed by the aristocrat Plato, believed more in elite rule than in popular rule) why the Athenians turned to experts for advice on all matters other than politics. "It is quite correct for your citizens to accept advice from both blacksmiths and cobblers on political issues." But this was not "democracy" as the word is used in the European debate of today. The aim was not for "the state to strive for the dominance of democratic ideas in all sectors of society," to use the language of the current Swedish Constitution. Democracy in ancient Athens was limited to the political sphere, to governance of specific common problems. In Athenian politics, every male citizen was consulted in public debates, was eligible to vote, and voted on whom should govern the city and be jurymen in the law courts. But this did not apply to the Athenian economy, to worship, to the arts, to medical care, and so forth. Democracy (to the Athenians of ancient days) was not a form of organization for science, the economy, art, religion, or ethics. Outside the body politic, democratic rules of decision-making were entirely voluntary and usually unsuitable. Anyone who sought to replace investigations at their academy by referendums among the staff was, naturally, welcome to try to do so. But this was not presumed to result in any philosophical or scientific progress. Anyone wishing to organize a manufacturing or shipping enterprise so that all employees might vote on the best way of working and earning money in the booming Mediterranean market was presumably able to do so, despite the risk that such an enterprise might collapse from inconsistency and confusion. Nor, obviously, could artistic beauty be determined by a majority vote, any more than the meaning of religion or the validity of the teachings of ethics. The myriad written comparisons of Athens with Sparta and other ancient forms of government show that much about ancient Athens was unique. A highly unusual circumstance that is already discernible in the myth of the genesis of democracy is that statecraft, artistic pursuits, the art of medicine, trade and industry, philosophy and religion - even sports and entertainment - were rather independent institutions. None of these dominated or ruled any other. The two major candidates for the position of dominant Athenian institution - religion and statecraft - were weak. Popular religion was a pastiche of propitiation and magic, much of it to do with agriculture. Its goals were to secure crops and avoid natural disasters; they were not concerned with the business of regulating a city. Athenian religion was removed from the energizing Persian gods of good and evil, carrying a stick of ethics from Zoroaster with which to encroach on the political sphere and dominate the arts and the pursuit of riches and knowledge. The body politic of Athens was also weak. It accepted no ruling élite, and also it excluded the majority residents: women were citizens but lacked right to a vote or a voice. Because of the large number of metics and slaves the number of eligible citizens who could throw pebbles in the voting jars represented probably only one fifth of the total population. This narrowed the political sphere. The major institutions were held together, not by one dominate institution, but by aidos, that is, public opinion. Beloved Pan and all the other Gods of this place! that all my possessions be in harmony with my inner man. and may I have such wealth as only the self-restrained man can bear or endure. This prayer expresses the attitude of moderation deemed necessary to maintain Athenian society with its many opportunities created by the pluralism of autonomous institutions. A society held together primarily by public opinion and with institutional autonomy for religion, art, science, economy, and the body politic may seem an unstable option. But the Athenian experience is a clue to something distinctly modern and something that might turn out to be uniquely European. The autonomous order of Athens and other Greek cities succumbed first to Macedon and then to Rome. Alexander the Great it did not turn to Europe. His Macedon armies marched to Egypt in Africa and to India in Asia. The Roman armies secured the Mediterranean basin and turned north to the heart of Europe. No army brought with it the Greek civilization and a democratic order. Athens itself, however, survived for centuries as a university town. Yet, from the other two sources of Western civilization - Jerusalem and Rome - came, as we said in the beginning of this lecture, rather different signals. Other options emerged to organize Europe. In ancient Palestine, God's chosen people had made religion the centerpiece of society. The great prophets were sometimes able to criticize the kings and command the allegiance of the people. In ancient Rome the statecraft took the leading role. Here a supreme and superb body politic dwarfs all other institutions. The Roman Republic set an inspired example of orderly rule. The Roman constitutions may now be forgotten. The traditions of civil law have survived and made indelible marks on Europe. To the Roman heritage belong our right to face our accusers, and the requirement to hear all sides of a case before passing judgment. In Eastern Europe the Roman Empire lasted a thousand years. Constantinople was called "The Second Rome." It was ruled by an emperor, albeit a Christian emperor. In contrast to the Roman Catholicism of Western Europe it permitted the Greek-Orthodox Church in the East to conduct services in the local languages. As a consequence, the bonds to the classical culture were weakened and the prospects of a renaissance diminished. Seen through the eyes of the East, Western Europe was strange, sinful, blasphemous, degenerate, and as dangerous as the plague. Russia refused to participate in a church meeting in Florence in 1439 when an attempt was made to united the churches of the East and West on response to the threat that the Turks then represented. When Constantinople had fallen to the Turks in 1453, the Russians began regarding Moscow as "The Third Rome." The revival of the Roman Empire has been recurrent theme in European history. The Frankish kingdom (484-814) was the first in a long series of attempts to revive the Roman Empire in Western Europe. Its great ruler Charlemagne called himself "King and Priest," an indication that a common authority, "one sword," would rule. It was the same solution as we saw in Eastern Rome. Still, immediately after the decline and fall of the Roman empire, the legacy of its glory fell upon the church, not the state. Here is the beginning of a European structuration process that still continues. Click Part II to continue the lecture.